Our Liturgic Dancers are doing a piece this evening at the Good Friday service involving lighting and movement with oil lamps during the stations of the cross. I ordered them from the Holy Land two weeks ago with assurances by the provider that they would get here in plenty of time for tonight's service. Well, they have been shipped but are definitley NOT here. 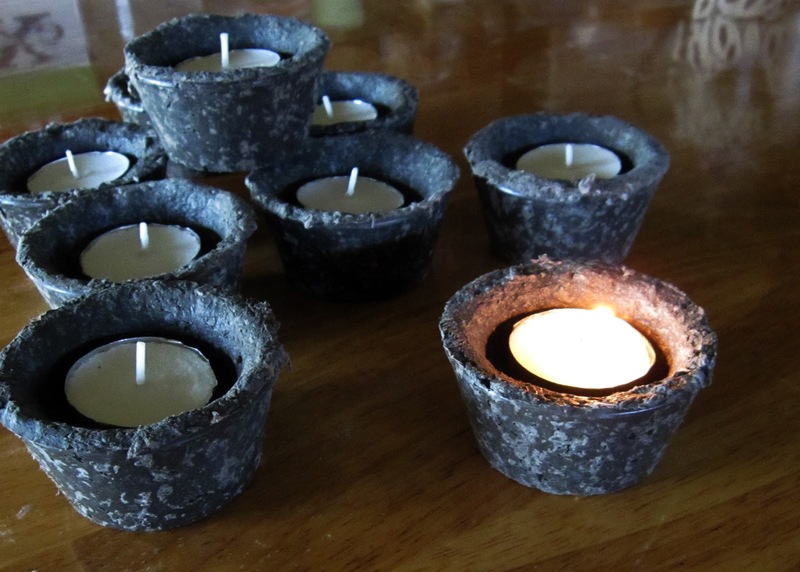 So I made up a quick batch of hypertufa and cast these little cups for the dancers to use instead of the oil lamps. Tea lights were glued into them so they won't have to worry about spilling oil.... Another rescue thanks to versatile hypertufa! 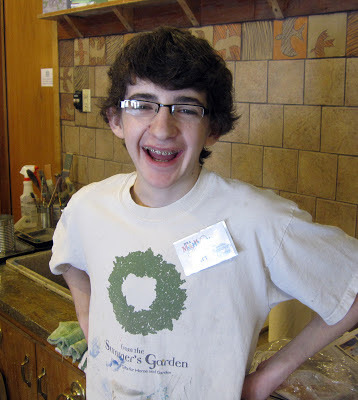 A sense of beauty combined with a sense of humor helps to make a garden warm and inviting. It is far more exciting to become enchanted when you enter a garden than merely impressed by scale or expensive plants. The way you arrange the space in your garden influences its’ beauty and its utility. The garden pathway often achieves this purpose. Pathways divide the space and direct passage and flow through your garden space….and, of course, there is nothing like stepping stones to create ideal pathways. Since a garden is a celebration of the wonder and beauty of nature, it makes sense to consider stepping stones made of natural materials. The most natural choice for garden stepping stones is real stone. If you live in an area where it is plentiful, you simply need to go on a stone foraging trip to find nice flat ones that will serve as stones. In more populated areas, you can search for a construction site, where land is being cleared for a building project. If you ask permission, they will often let you take all the stone you want for free. 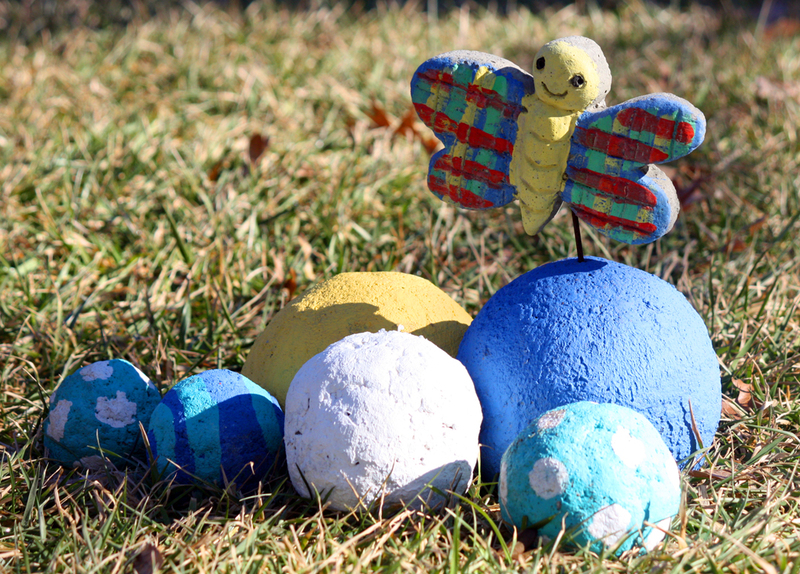 Concrete is manipulated natural material and KC gardeners know it is one of the most amazing materials for creating garden stepping stones from simple basic shapes to multicolored dimensional sculptures. Cast stone is similar but is made of pulverized stone held together with a binder. 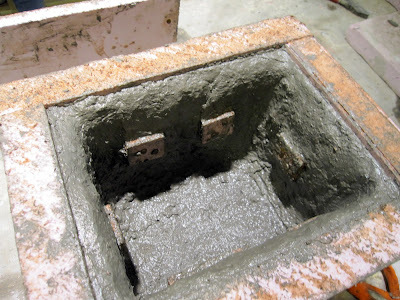 It is desirable because it can be cast and does not have to be finished further. Another manipulated natural material is rubber. The use of rubber garden stepping stones and mulch is growing in popularity, especially those made from recycled materials. These stepping stones are soft and will not break! 4. Bricks and pavers can be used as stepping stones in the creation of garden pathways. It is especially nice to use bricks salvaged from old buildings or roads. This is much more cost effective than purchasing new materials. "Peace On My Porch." Weekends April 26 through May 27! You can be creative and use what you have. A guy I know had a large tree fall during a summer storm. He sliced large two-inch thick rounds from the trunk with his chainsaw and used them as stepping stones in his garden. 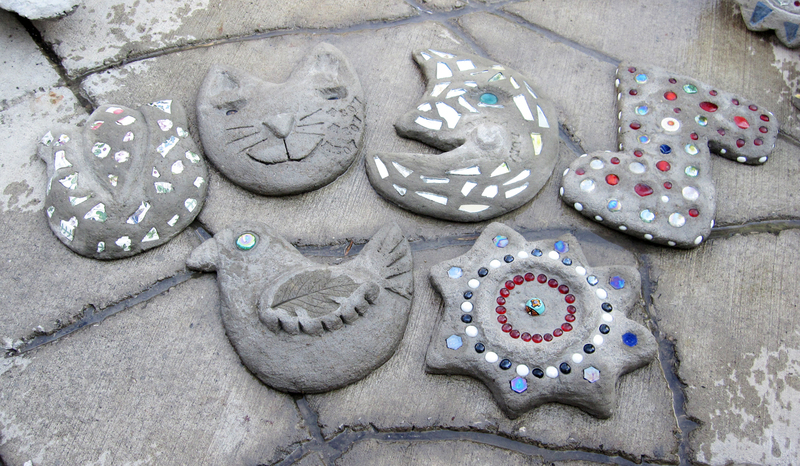 Have fun with your plans for garden stepping stones, and try choosing a theme. 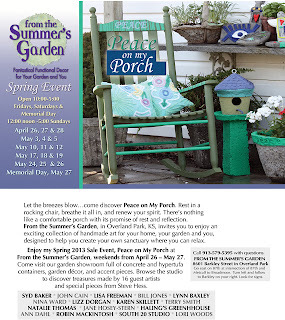 If the idea of gentle breezes and relaxation sounds appealing, get your inspiration from Peace on My Porch, the theme for From the Summer’s Garden 2013 Spring Sale. Special events and a great selection of KC artists’ pieces for your garden await … April 26 through May 27, every weekend! Come relax with us! People and their pets develop special relationships that are fulfilling and meaningful. It is difficult when their time with us passes and we lose them. Many find creating a resting spot in their gardens provides a fitting tribute to a well-loved pet. It also helps to aid the grieving process and preserve pleasant memories. Here are five meaningful yet practical ideas for a garden memorial for your pet to preserve the memory of your beloved furry friends. Our cat Leo was a super garden cat, very effective at keeping the rabbit population controlled. To honor him, we created a cat garden filled with herbs he loved to sniff and chew during his reign as our king of the garden. Cats like to sniff and chew on plants. To make it easy to maintain and for Leo to move freely, we chose low to medium height plants. Learn more about plants for cats. Please note: Dogs don’t really enjoy eating plants as cats do, so you can put the plants in the dog garden that please you. Learn more here about harmful plants for pets NOT to include in your garden plans. 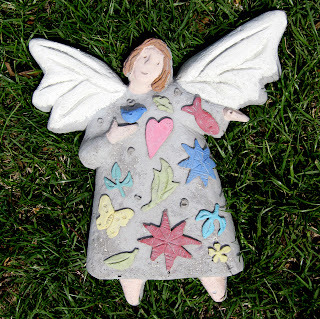 Ceramic tiles can easily be hand-painted to customize a pet memorial. Custom info and a caricature add light-hearted fun to this memorial planter. The Dog’s head sculpture can be place on the shelf attached to the planter. People move around much more than they used to. Many are upset when they bury a pet in one home location and then have to move away to another. I’ve made several memorial stones for pets incorporating the actual ashes of the pet into the concrete mix when the stone is made. In this way, the pet owner can take the stone with them wherever they move. Another idea is to capture the impression of the deceased pet’s paw prints in the setting cement. This results in a lasting, very individual commemoration. If a memorial on the ground does not provide sufficient visibility, there is nothing like a garden stake to serve as your pet’s memorial. The same custom techniques used for stepping stones can be applied to a garden stake. No matter how you choose to commemorate your pet, it will be a labor of love, something that will bring back pleasant memories each time you enter your garden. Many more sources of inspiration await at the upcoming Spring Sale at From the Summer's Garden, every weekend in April through May. Special fun events, mingle with artists, chat with Steve, and renew your spirit for a fantastic spring season! See you there! Somehow receiving a personal invitation makes us more interested in attending an event. 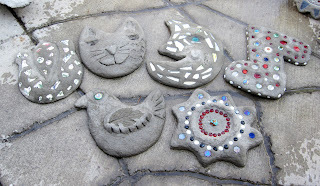 Stepping stones in your garden or yard do the very same thing for everyone who enters your outdoor spaces. 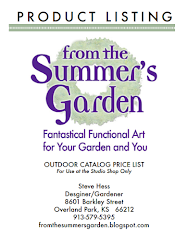 If you want to show off your garden in K.C., a meandering trail seems to whisper “follow me”. If you have no idea where to place stepping stones, think about any high traffic areas in your lawn. If you always walk from the garden to the hose, if the kids always trek from the back patio to the play area or if the animals always head out to the decorative fountain, then chances are that your yard already has a beaten down pathway. Turn that trammeled grass and dirt into something beautiful by laying down garden stepping stones among carefully selected plants. If you don’t already have an established path, then extend an invitation to somewhere interesting in your landscape. A path strewn with stepping stones will beckon people to sit under the arbor, examine your flower beds, rest under a shady tree or check out a decorative set of custom garden containers. Stones show everyone where to go and practically take them by the hand to get them there. Your focal points become irresistible destinations at the end of a cobbled path. Garden stepping stones can be as varied and exciting as every new path itself. If you want to create a path that looks almost like nature itself is doing the inviting then flagstone or sandstone will do the trick. These flat stones come in muted, earthy colors and each stone has its own unique shape. Slate stones also reflect the colors of the earth and create lots of visual interest because of their variety. You may also experiment with quartzite, flat garden stones flecked with glittering quartz. At From the Summer’s Garden, concrete is the material of choice for creating a path with garden stepping stones. Designer Steve Hess suggests that any custom or designed stones are best set off if placed among or in-between plain concrete or natural stones to achieve visual rhythm and rest. Too many designed stones in succession can become busy and overdone. Learn more and enjoy some fresh inspiration at From the Summer’s Garden. 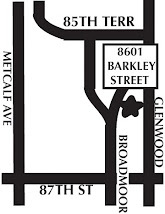 Attention KC gardeners: the Spring Sale events are coming up soon, every weekend April through May! Simple, decorative garden spheres are one easy way to create or enhance a focal point in your garden. Depending on the size, these decorative balls can even top-dress container plantings when used in multiples. These can be made from concrete or even a fine textured hypertufa. 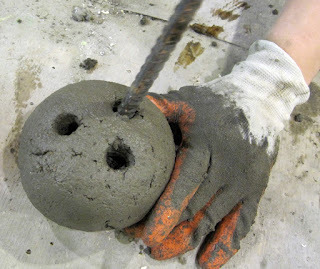 For small balls, I use sand mix concrete but for larger spheres, recycled paper hypertufa works better because it is much lighter in weight. This recipe is in “parts” which means that as long as your “part” remains consistent you can use any size you’d like. The first time you make it use a smaller size until you get the hang of it. A small plastic bucket works well. Fill the dry bucket with cross-cut shredded paper. Empty into a large plastic mixing container and cover with one part hot water. Make sure the paper shred is evenly wetted. Let soak overnight. This makes the job of pulping the paper a piece of cake. Put on some latex or rubber gloves and then vigorously knead and mash the wet paper shred into a pulp. The more you work the pulp, the finer the texture of your hypertufa. When you are happy with your pulp, add one part sand/ concrete mix (yellow/black/red bag from home improvement stores) in small amounts and mix to a clay-like consistency. If it is too wet and slumps, add more concrete mix. Now you are ready to make the balls. 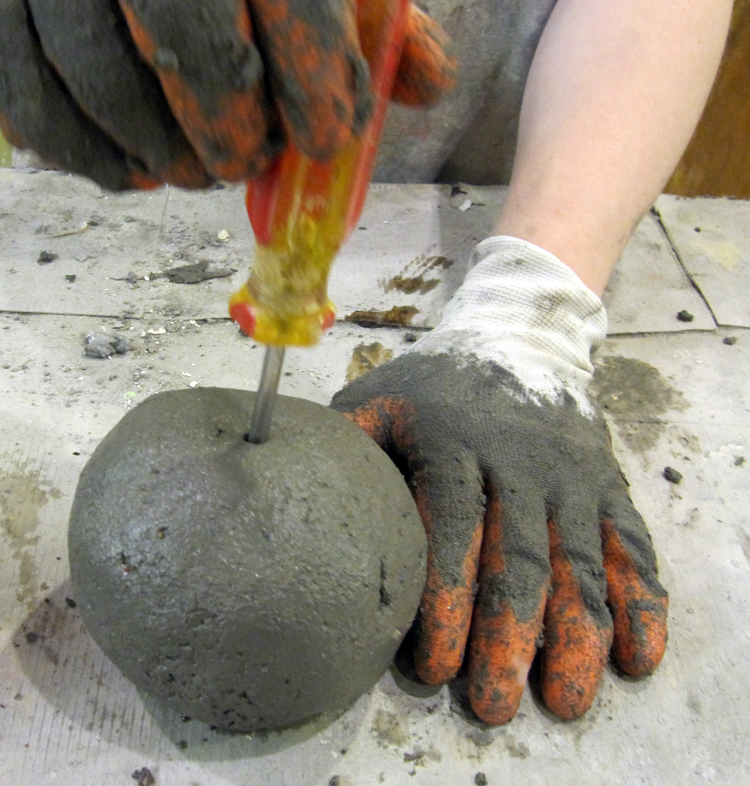 Using the same action you use to make a snowball, scoop up the hypertufa and shape into a ball. Set the finished balls on a plastic covered surface and set a timer for 1 and ½ hours. When the time is up, reshape the balls back to a perfect sphere. While they rested, gravity will have caused sagging. By going back and re-shaping them during their setting time you will end up with nicer, more spherical shapes rather than melting globs. When the balls have set allow then to cure for a week and then you can place them where you want or use exterior latex paint to decorate and stain them with color. These tufa spheres come in handy and can be used as stands for decorative stakes. To make a simple stand, use a metal rod to pierce a hole in the top of the ball. When dry, it will serve nicely as a stand for a small garden stake. They make nice toppers for metal stakes or a trellis in the garden. I have poked my eye more than once on the bare end of a rebar stake in the garden. These balls are not only decorative, they can be a safety feature! If you poke three equi-distant holes in ball, it will make a nice garden tripod topper for growing vines. Though the landscape today is still tucked beneath a blanket of cottony snow, it is not too soon to start thinking about the days when the sights and sounds of spring will be luring us all out of doors. New blooms and thoughts of the garden will then work like an elixir stirring us to get outside and get our hands into the dirt. 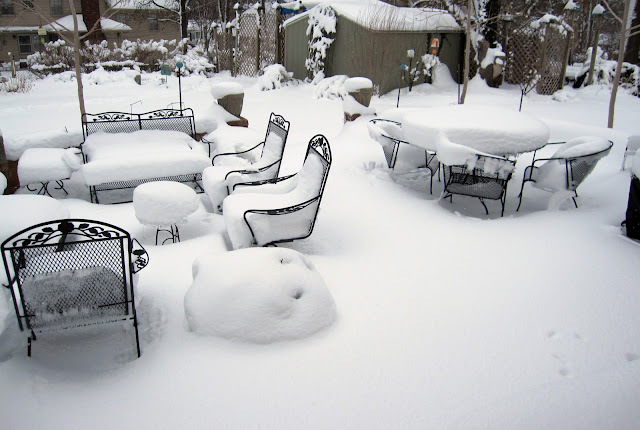 But who says we have to wait until the snow is gone and the sun is out before we enjoy the fun of gardening? Now is a great time to enjoy that pleasure by creating your very own garden container. So … why not hypertufa? (Yes, it’s a funny word, but once you try it, you’ll love it.) 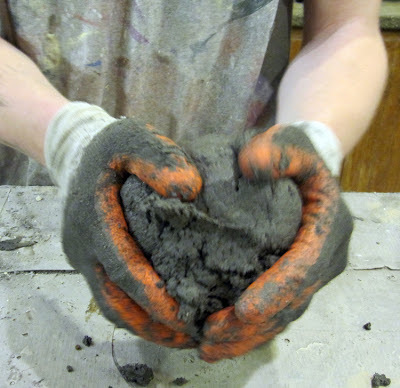 Mixing, molding and sculpting with hypertufa (“tufa”) means getting your hands into a blend of water, cement, sand and recycled paper and crafting a garden container or other piece of art for your garden with a theme you choose. It’s functional, beautiful and fun – and your options include everything from garden containers to planters, water basins or stepping stones. If you’re new to the joys of “tufa,” From the Summer’s Garden offers a unique “green” version of hypertufa at Studio Workshops throughout the spring, summer and fall. 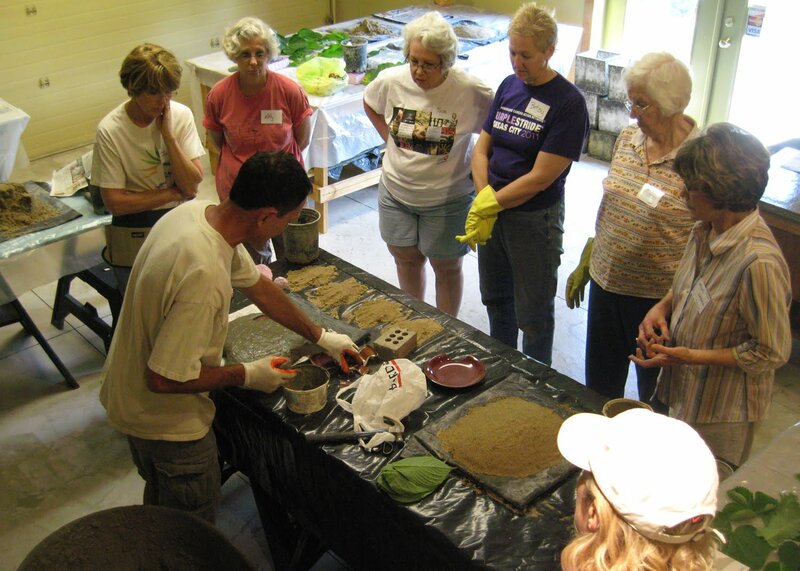 Each workshop is a consecutive Saturday and Sunday on a weekend, from 9 a.m. to 12 p.m. 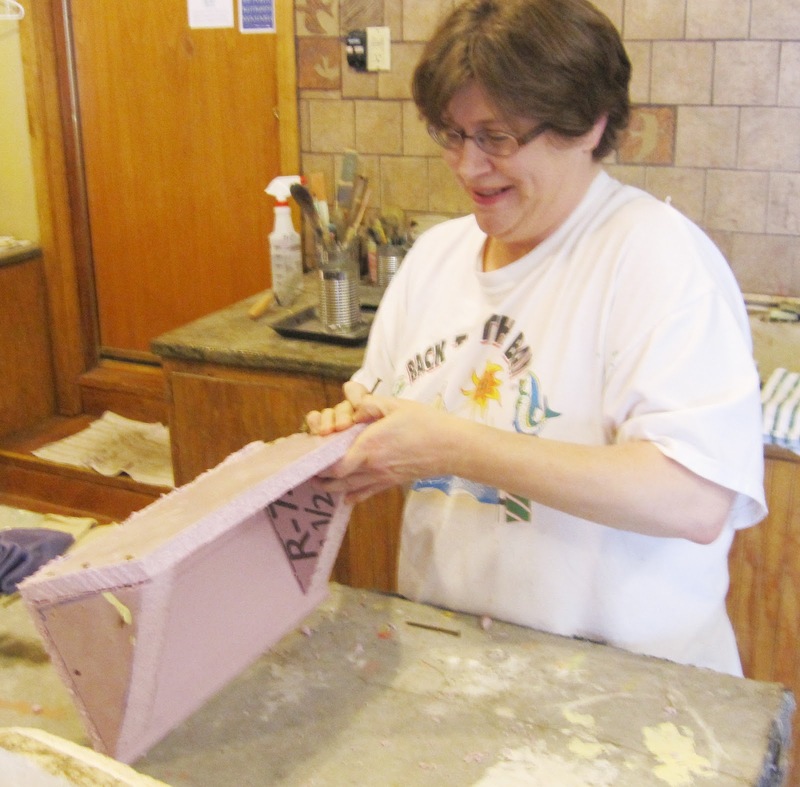 Participants can take home four to five finished projects, including a creative garden container. 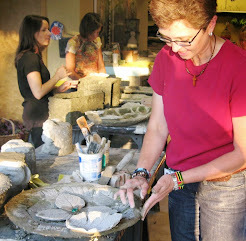 The next Hypertufa Studio Workshop is March 16 and 17, 2013. What can you make at a From the Summer’s Garden Hypertufa workshop? Hypertufa garden containers allow all KC gardeners to dream big and take action while waiting for spring’s arrival. 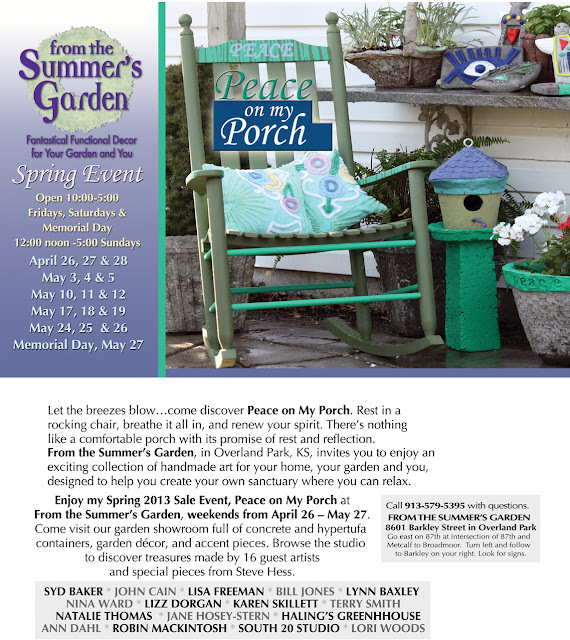 From the Summer’s Garden in Kansas City is your resource, offering workshops throughout the year and legendary Spring Sale events every weekend in April and May. FAIRY GARDENS IN THE SNOW! Here's a first- making hypertufa in the snow! The last creative workshop of the winter/spring program went on in spite of our snowy environment. Of course, it helped to be able to work INSIDE the studio. This last group did a great job making their own fairy gardens. 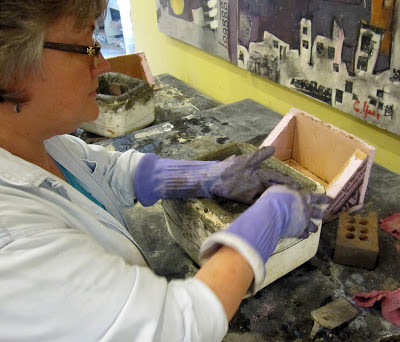 We discovered that the mixing of recycled paper pulp for the hypertufa was made much easier by using very hot water in mixing shredded paper and the sand with the bonus of warming up chilly fingers! 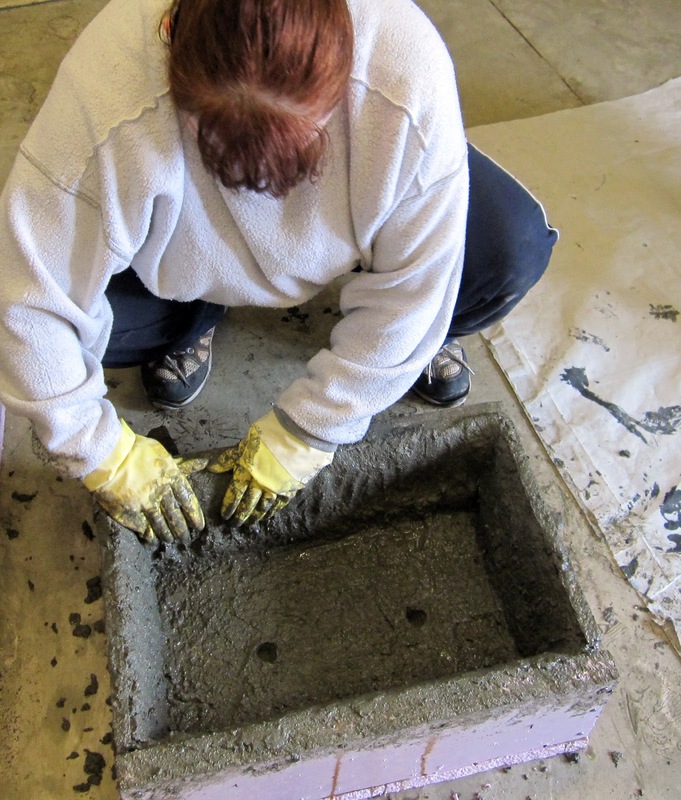 Janet uses her finger tips to cast the small dimensions of the house mold using hypertufa. 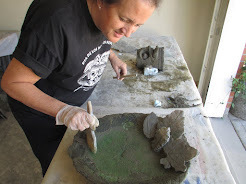 Lori puts the finishing touches on the rim of her trough, the large hypertufa planter that holds the fairy garden. Studio Assistant Matt's a great guy with a terrific attitude. He helped participants cast their molds and mixed up three huge batches of tufa for everyone. Note how neatly this mold has been hand cast by Bob. He will have very little clean up to do when he unmolds his house. Picture-perfect for certain!